Even though e-learning is a well-established method of training in many businesses and industries, there are still several aspects of it that are misunderstood. This has led to a range of different myths being repeated. 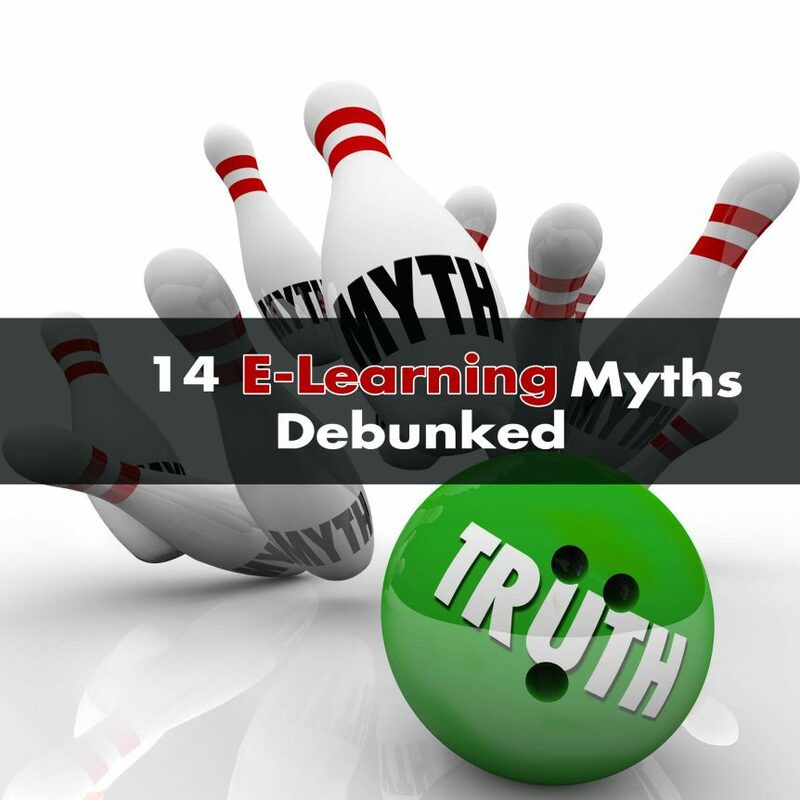 Here are 14 of the most common e-learning myths debunked. People of all ages can benefit from e-learning courses. In fact, your learners won’t even need technical skills. So long as they can use a smartphone, they will be able to complete an e-learning course. Just because many e-learning courses don’t have in-person instructors doesn’t mean e-learning has to be impersonal and unsocial. In fact, it is relatively straightforward to include social elements, plus connecting learners with each other is common. E-learning developers need technical skills to create e-learning courses, but e-learning is not a technical issue. Instead, developing e-learning courses is about training, education, and learning. These are the most important skills for e-learning developers to have. Furthermore, you should not assign the development of e-learning courses to your IT team by default. In some situations, they may be the best people to look after it, but e-learning is about training, it’s not a technical issue. Following on from the above point, graphic design is not the most important part of developing an e-learning course either. Of course, good graphic design is crucial, but the focus should always be on learning. E-learning courses are often given to employees with the expectation they complete the course according to their own schedule. Many businesses are concerned that employees simply won’t do this. From our experience, however, empowering learners is crucial to the success of any training strategy. Therefore, employees do complete the e-learning courses given to them. The main objective of an e-learning course is not achieving good levels of interactivity but, instead, to achieve your training goals. This could be giving employees new skills, for example, reducing accident rates, or improving the levels of service you offer to customers. Interactive elements in your e-learning course can help you achieve these objectives, but they are not the objective. Ensuring e-learning courses are fun often helps, but it’s not essential to success. In fact, if you focus too much on making your courses fun, you might distract or frustrate learners. This will make it harder to achieve your training goals. This is a myth too. In fact, it is easier to measure the effectiveness of e-learning courses than it is for instructor-led courses. The same goes for return on investment. Measuring effectiveness and return on investment is achieved by analysing course data, analysing results from quizzes, obtaining learner feedback, observing improved business outcomes, and more. While e-learning courses can replace a lot of instructor-led training, there is still a place for the instructor. This includes courses wholly delivered by an instructor but there are other options too. This includes synchronous e-learning where the e-learning course has elements led by a remote instructor. Blended learning is another option where some parts of a course are completed using e-learning modules while others take place in a classroom. There are a lot of training topics that work best when the e-learning course is custom developed, but there is a place for off-the-shelf e-learning too. A good example is training on how to use common software programmes. In addition, the benefits of off-the-shelf e-learning are too important to ignore. This one is wrong too, despite some businesses believing they can cut costs by just using off-the-shelf e-learning content. This makes training a box-ticking exercise where there is a reduced focus on achieving training goals. The best approach is to have a mix of both custom-developed content and off-the-shelf e-learning courses. This myth is wrong on two fronts. Firstly, when you compare everything, e-learning is often less expensive than classroom-based training. This includes taking into account the cost of travel and accommodation, lost productivity, the cost of instructors, the cost of time spent preparing courses, and the costs that you incur when people can’t attend a fixed-date classroom-based training session. Another reason why it’s wrong to say e-learning courses are expensive is because it’s wrong to focus on costs. Instead, you should focus on return on investment. Again, it’s easy to build in elements and tools in your e-learning courses that give learners access to trainers. This may not be real-time, but it is possible for learners to get the support of instructors. Following on from the above, it’s also possible to enable learners to collaborate with each other. This works in a similar way to online collaboration and project management tools. Therefore, collaboration can not only take place, but it can be highly effective. As a training delivery method, e-learning offers a wide range of benefits. How, and if, you use e-learning, however, depends on a range of factors including the course topic and your training goals. This is what you should focus on when considering e-learning, not the above myths.